How we get from the BEFORE to the AFTER. Making Modern Home represents a unique, integrated approach to home design, renovation, buying, selling, and real estate investing. 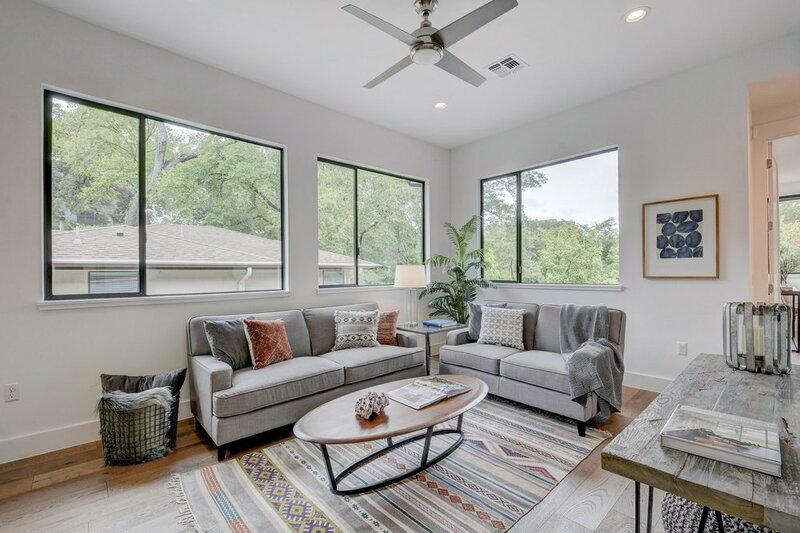 Specializing in Austin's vibrant central neighborhoods and unique historic, vintage, modern, and mid-century properties, Making Modern Home is committed to improving homes, neighborhoods, and lifestyles. Modern, warm, organic living room with layered neutrals and mid century signature pieces. Black Milgard windows and doors. Linear Afire fireplace in the stone hearth. Living room looking towards the marble and walnut kitchen, vaulted dining room, and wood ceiling. Urban gray wood floors compliment the warm tones of the coffee table, abstract art, and cabinetry. The dining room is a jewel box with three sides of glass, walnut wood ceiling, and a large Nelson bubble saucer pendant. It perfectly combines modern, classic, timeless, mid century, and transitional styles. I love this shot of the plant and mid century Hans Wegner chair opening to the outdoor living space. You can see the Ipe ceiling. A creek view is just beyond making this this perfect urban oasis. The dining room is open to the kitchen island bar. The vertical grain walnut cabinets, Thremador appliances, and calcutta marble countertops add luxury to this kitchen. Modern dining room with Nelson pendant, glass walls, and wood ceiling. The custom steel and glass Durango door was one of the design starting points. The metal elements are picked up at the cable railing stairwell and the Restoration Hardware Bistro light fixture in the formal living room. This entry foyer is sure to impress. 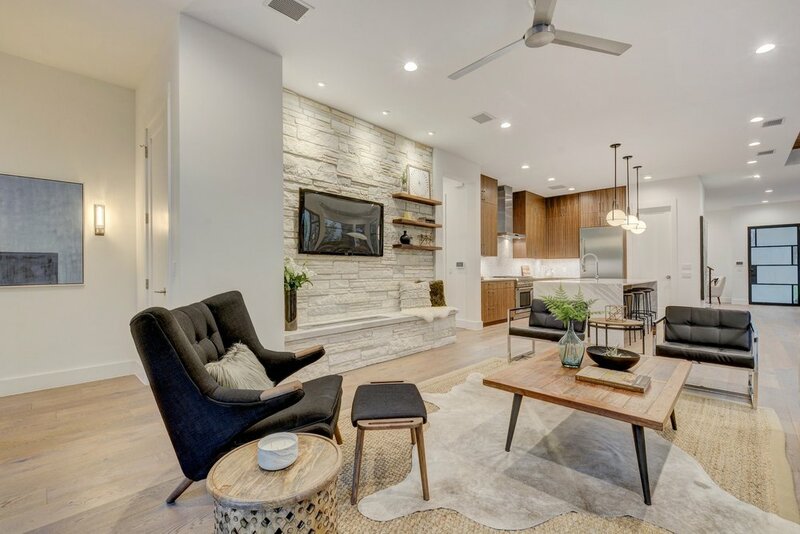 The formal living room includes an accent wall in Benjamin Moore Sea Star, black accents, cognac leather stools, a layered cowhide and mid century modern wood wall panels. Another view of the impressive foyer and modern stairwell with shiplap at the landing. 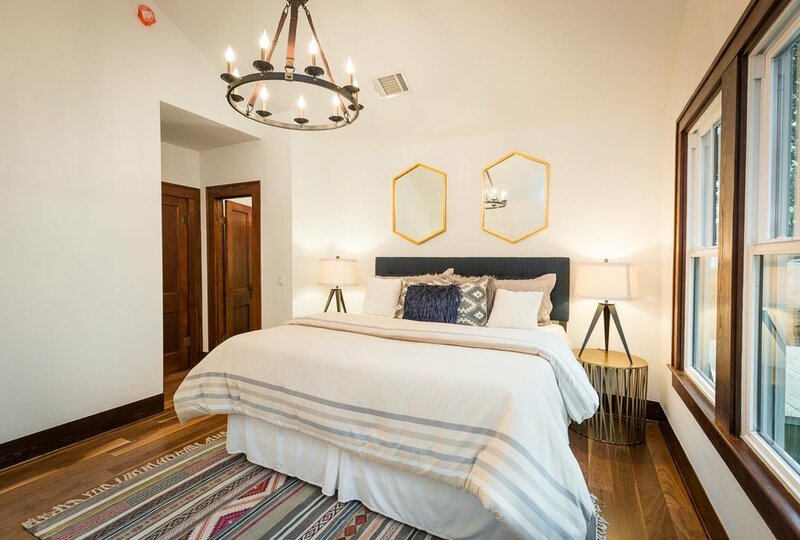 The luxurious main floor master bedroom is a rare offering in the urban 78704 Bouldin neighborhood. 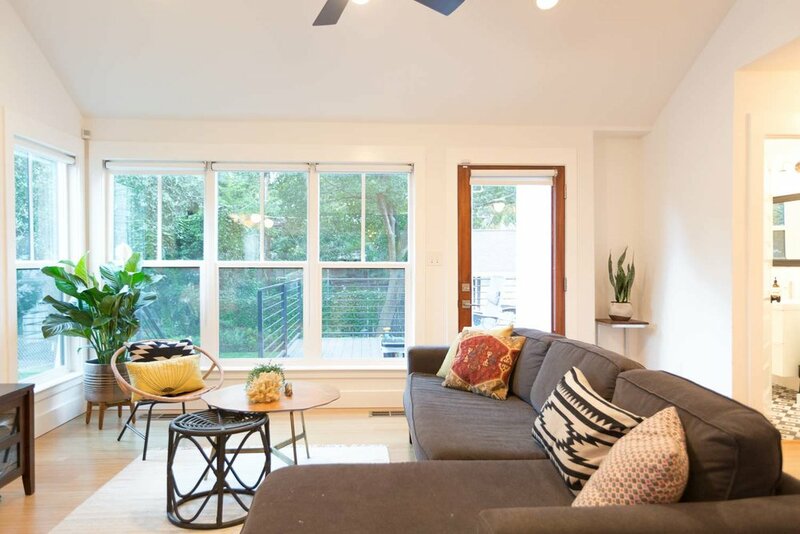 This room offers a sitting area creek views, lots of natural light, and access to an outdoor patio. The master bathroom makes a statement with natural elements such as the teak shower floors and walnut cabinetry. It offers luxurious features such as the freestanding tub, pedestal sinks, wall mount faucets, and full silver travertine marble walls. Another view of the teak shower and freestanding tub from Signature Hardware. 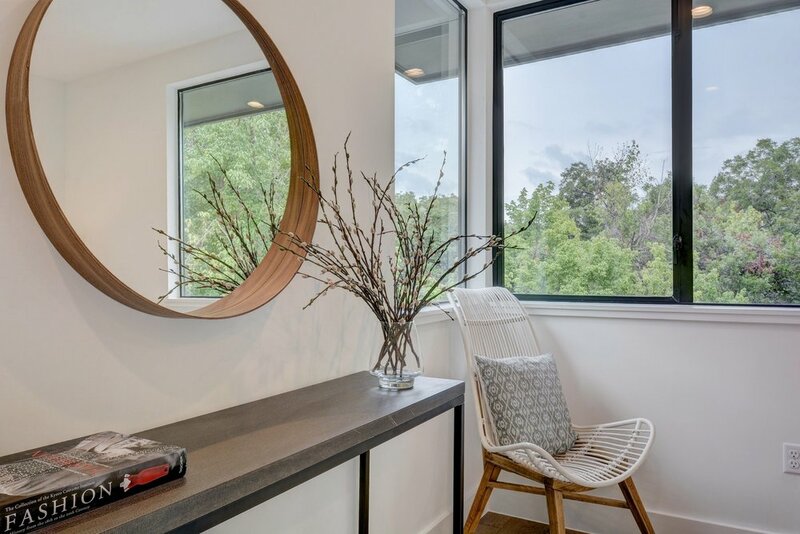 Enjoy downtown Austin view from this Bouldin media room with beverage center wet bar. The second master suite is upstairs and includes an ensuite bathroom. The style is Marfa Texas inspired Minimalism. The art over the bed is from World Market. 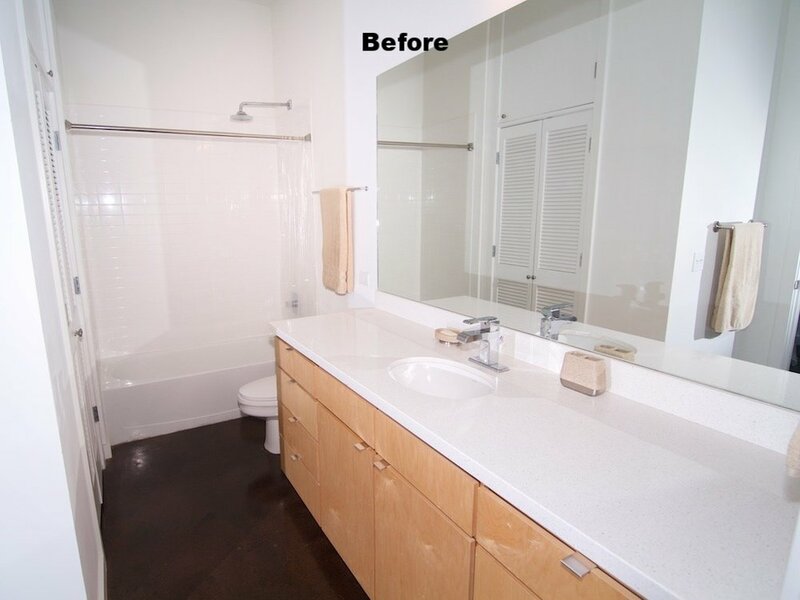 The second master bathroom includes white quartz countertops, cross bar faucets, and walnut cabinets. Walnut, gold, and marble make this powder room luxurious and ready for guest. The Delta Trinsic faucet compliments the black and gold hex mirror. Who wouldn't love this outdoor living area? The ceiling is Ipe, the fan is Minka Aire. This screen porch is perfect to be screened. Another view of this modern, inviting living area ready for entertaining! This exterior design was developed to appeal to both modern and traditional styles. We call it Modern Prairie Style. Ipe wood, stone masonry, stucco, Hardie, and a glass garage door, are assembled into a highend look for this narrow urban lot. One of Making Modern Home's latest projects! 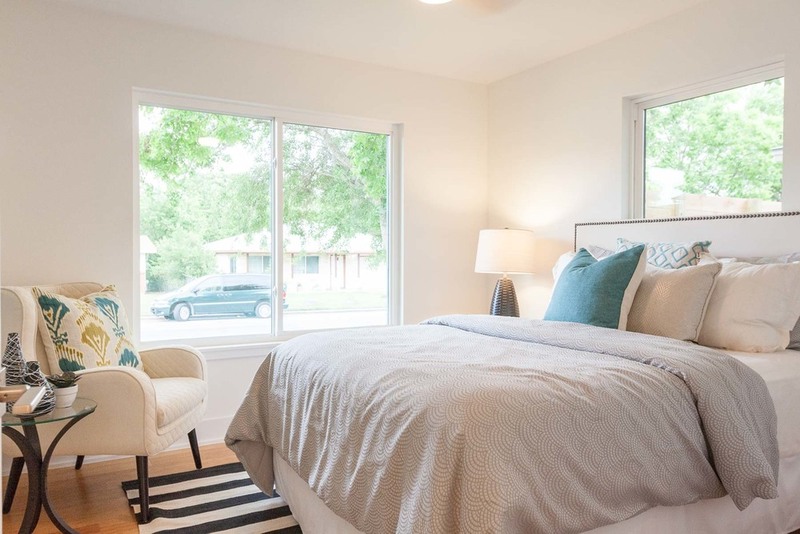 We served as the project designer and Realtor for this stand alone condo at 1107 Estes in East Austin 78721. We helped develop the overall real estate strategy, the exterior design, the floor plan, and all the finishes and fixtures, and even the landscape. FOR SALE for $450,000. Contact me for more info! 3 bedrooms, 2.5 bathrooms, 1 car garage, 1799 SF. MLS #9685951 Broker is Stepstone Realty LLC. More info in WORK section of this website. The charming Modern Cottage architecture is perfect for a white color scheme with wood accents. The modern front door and balcony contrast the barn lights. The french doors are painted Benjamin Moore Seastar and the garage door is my go-to Sherwin Williams "Urbane Bronze". Modern Kitchen with Ikea cabinets, walnut butcher block with a waterfall edge, Rustico Casablanca Cement Tile, island, matte black faucet, and copper accents! Dream Master Bedroom with vaulted ceilings, balcony, built-ins and white oak floors. The incredible kitchen was made by combining 2 rooms. The sliding door leads to the back yard. The Spanish tile / Cementi style tile is actually under $4 a square foot! We vaulted the ceilings and added reused shiplap from the house remodel. Honed black granite countertops, a custom farmhouse teal island with walnut butcher block top, matte black faucet and hardware, floating shelves compliment the Ikea Grimslov shaker style cabinets. The bar to the right is an Ikea shoe shelf which is low profile. Above it is a World Market mirror. 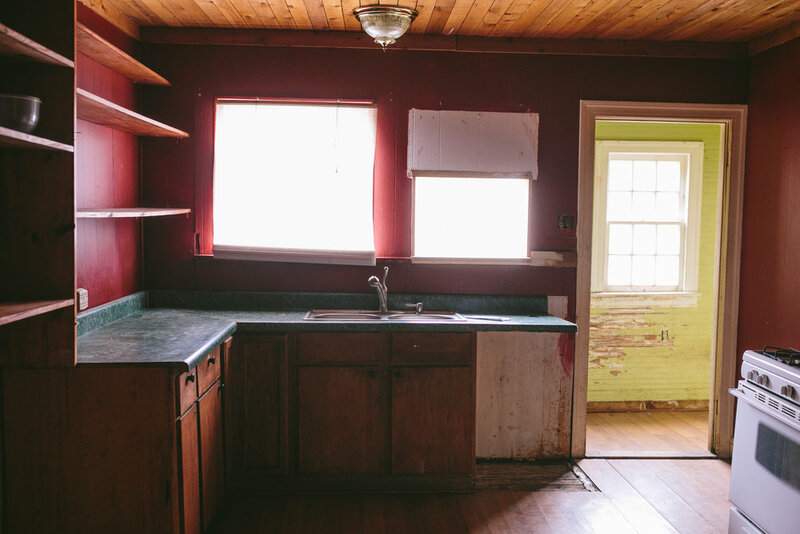 We love the kitchen's warmth and personality especially with the original dark wood trim! Another view of the kitchen towards the open dining room. Notice the vault and shiplap continues. Another view of the bar and teal farmhouse island with walnut butcher block. The yellow barstools stand out and tie into the front door color and gold accents. The hall bathroom has so much character using Spanish tile patterned floor tiles, white subway tiles with black grout, an ikea vanity, and a gold mirror. 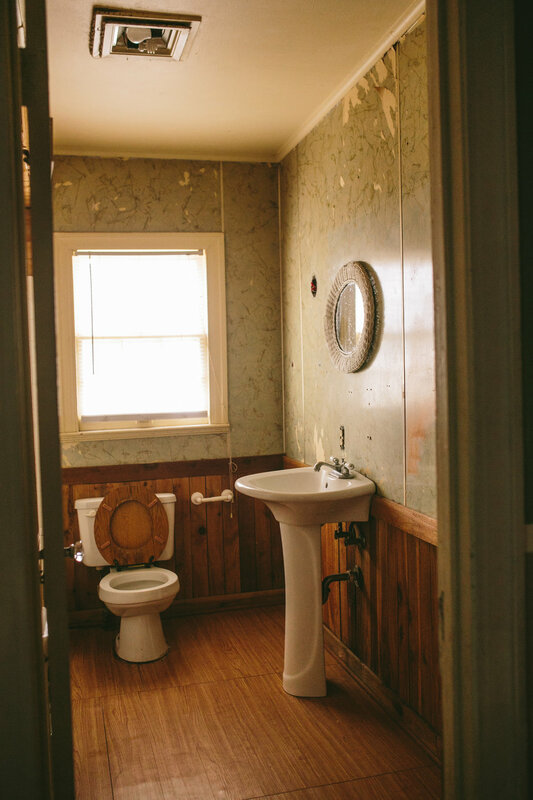 But what really makes the bathroom interesting is the original wood shiplap ceiling. It was exposed since the drywall had fallen down. The sophisticated master bathroom is actually all new since we added a second bathroom in the existing house footprint. We stole some room from the hall bath and the master bedroom. The banana leaf wallpaper is a bold statement, but it works so well with black hex floor tiles and original dark wood trim and doors (salvaged from the house). Carrera marble and gold fixtures make the bathroom even more luxurious. Another view of the master bathroom in this amazing bungalow. Traditional bungalow porch with thoughtful detailing and the American flag. This bungalow is an American Craftsman classic now! The master bedroom can accommodate a king size bed. The vaulted ceiling, chandelier, walnut floors, and dark wood trim add so much character and warmth to this amazing room. Another view of the master bedroom. Elite Austin Staging provided the perfect staging for the exceptional room. Notice the window bank with dark wood trim. This room shows the beauty of the dark wood trim, new windows, walnut floors, original bronze hardware with (new) crystal door knobs, and natural light. 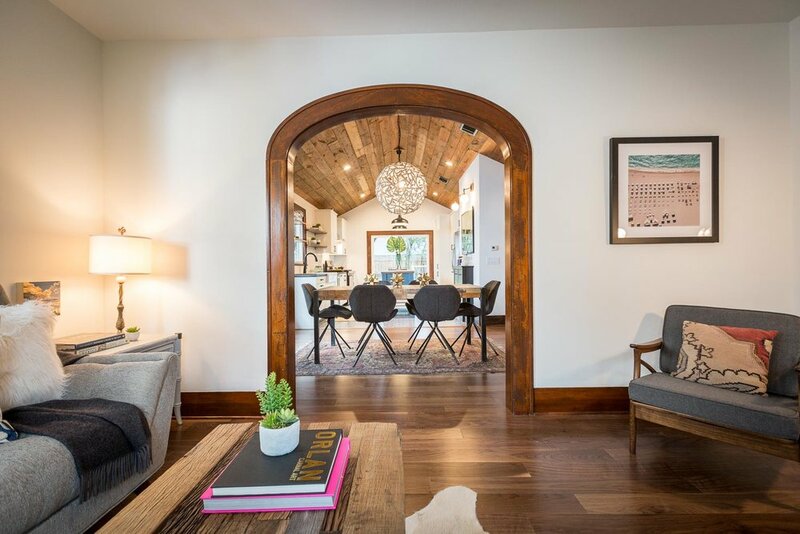 One of my favorite views from the living room into the open dining room and kitchen showcasing the orgiinal wood arch. Looking through the window, you will see the house Making Modern Home remodeled a few months ago. 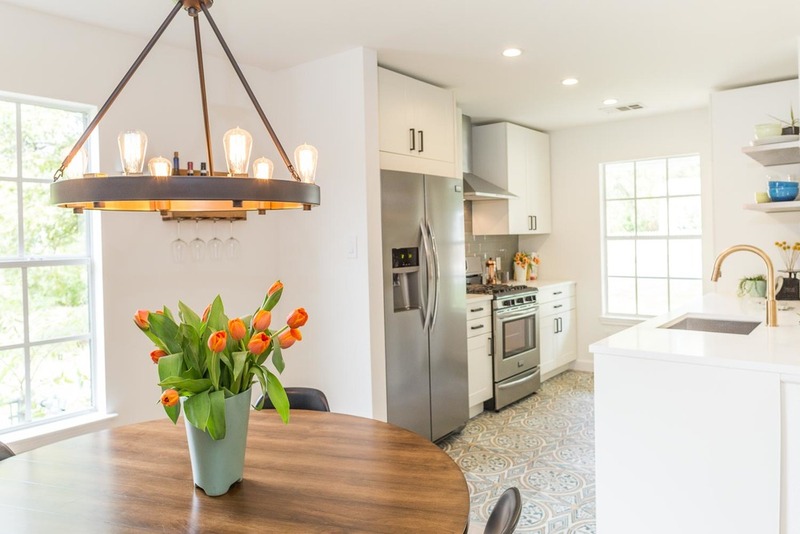 Check out the light fixture above the dining room table. It's from Pottery Barn Teen and I got from the outlet for just $70! 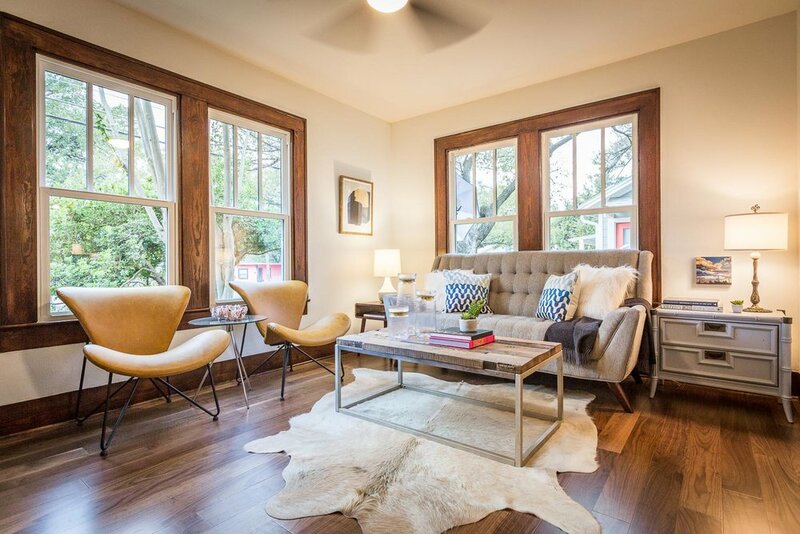 Elite Austin Staging did an amazing job perfectly capturing the feel of the home. Another view of the original wood archway. Notice the yellow front door and coat rack behind it. The coat rack was made out of a piece ship lap and the mismatched door knobs (ceramic and metal) from the house originally. The old door plates were reused, but the crystal knobs are new. We refinished the old doors. The banana leaf wallpaper is hand printed. The hallway is one of the most interesting areas of the Austin bungalow. The original shiplap and trim is showcased. My favorite flea market painting hangs in the hallway and brings all the colors together. One last picture of the happy front porch! This before pictures doesn't quite show the extremely poor condition of this "Tear Down". The roof had sagged in many spot and trees limbs were sticking into the attic! The bathroom before was in terrible shape, but it was large enough that another bathroom could be added in the same approximate footprint by stealing a bit of space from the master bedroom. So, yes it's a total wreck before, but could you see the potential? I decided right then and there I would buy this house. I wasn't going to let another developer tear it down. Even though, admittedly it was all but falling down. The kitchen just needed a little paint right? The only good thing I could say about the master bedroom is that was just large enough that we could add a walk-in closet and 2nd bathroom when combined with some room we stole from the kitchen and hall bathroom. You won't believe the transformation of this once forlorn French Place bungalow. 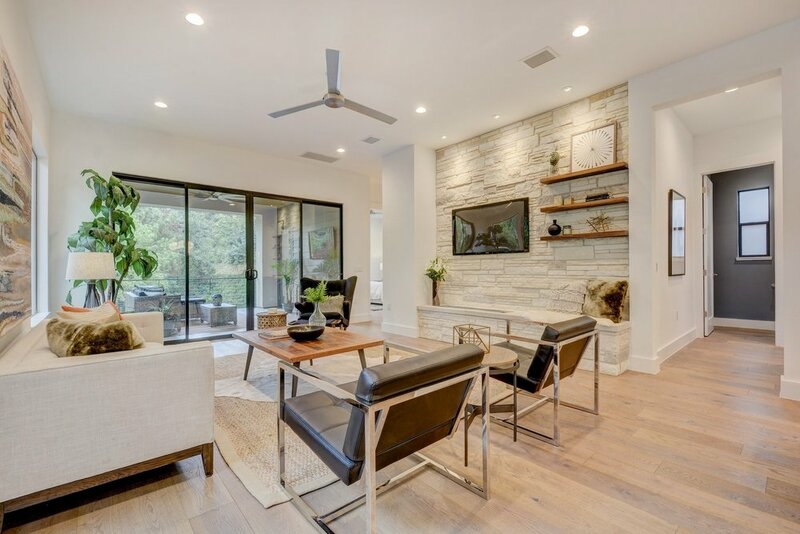 Completed early 2015, Making Modern Home lovingly enlarged and remodeled this space into a functional, attractive family home on a very limited budget. Our interior and exterior design, floor plan revisions, and project management made the most of the existing home. We expanded into the attic to add two bedrooms and bathroom. We had to fit a stairwell into the existing footprint. Ochona architecture did a brilliant job making it work! The homeowners love their home and complimented the interior design with their thoughtful decor and style. The home now has 4 bedrooms, 3 bathrooms, 2 living areas, vaulted spaces, and a kitchen as the hub of home! From the beginning Making Modern Home knew the way to add value was expanding into the attic; it wasn't easy getting the right structural upgrades and floor plan in place, but we are thrilled with the results and the homeowners are appreciative of all the value added! Notice that we reused the dining room hutch as a linen cabinet in the downstairs bathroom. We also plumbed for a gas fireplace to be added in the future in the formal living room. 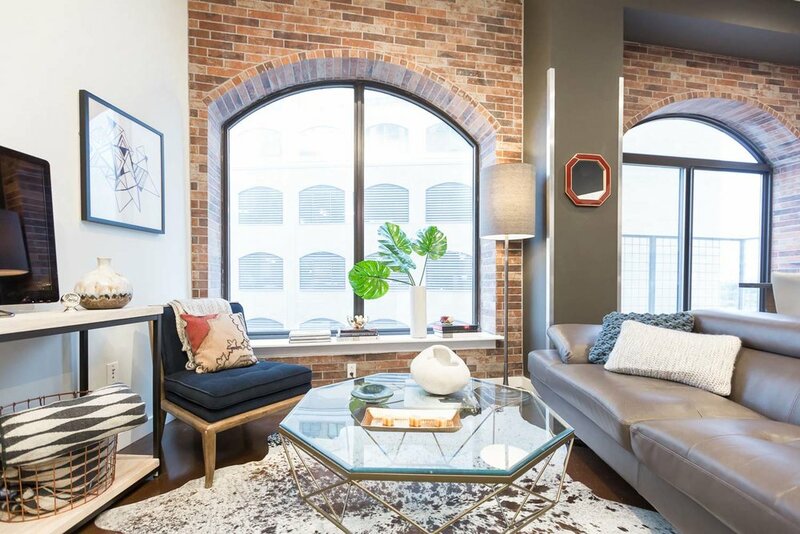 Our favorite feature is the awesome Jeldwen windows we designed. 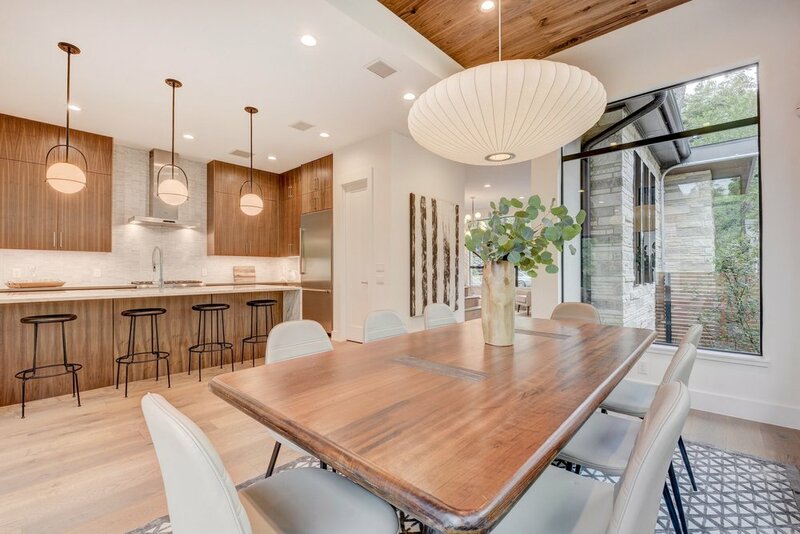 We love the homeowner's decor and light fixture combined with our thoughtful window placement, ceiling vaults, and floorplan designs in this modern dining room. Who wouldn't love this awesome kitchen Making Modern Home designed. At the center of the home, we had to be strategic with the layout. The black cabinets and white quartz countertops, combine nicely with the wood floating shelves and wood barstools. The formal living room has been completely remodeled with new windows and finishes. We love the entry nook common in 1940s homes. The durable bamboo floors are perfect for a family friendly home! This den used to be a bedroom. Now it's vaulted and open to the kitchen. You can see the stair case going to the newly expanded into attic. The metal railing was splurge, but the expense was well worth it to create a modern family room. You can get an idea of the great floor plan this home now has thanks to Making Modern Home's space planning. 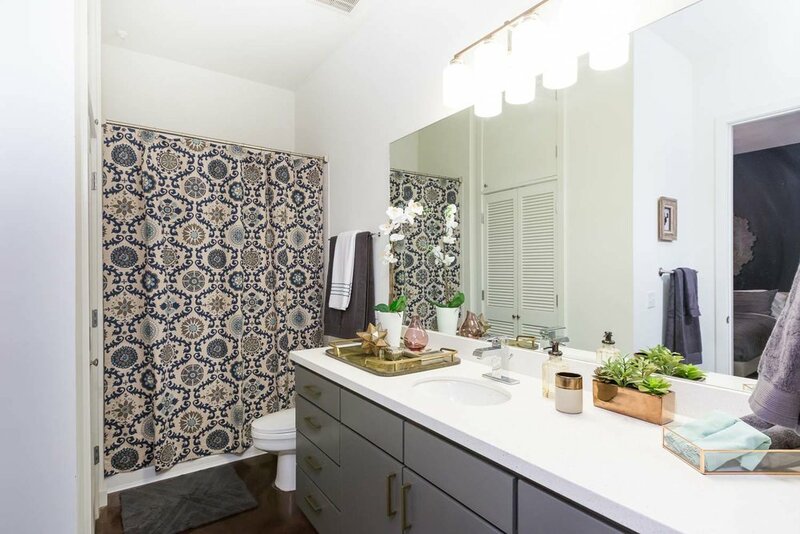 We love the guest bathroom with the bold black and white tile patterned floor. We reused the original dining room hutch as a linen cabinet. It sings in a soft aqua color. The modern ikea vanity was an affordable addition. The exterior post-renovation is much higher quality. It's the focal point of the neighborhood now! The white siding with black Jeldwen 2 over 1 simulated divided light windows are a classic combination. The yellow front door is welcoming way to dress up a $118 front door :) The lighting and mailbox are inexpensive options from Lowes. After - We added the brick at the arched windows and selected Sherwin Williams Deep Spacethe walls. The cabinets were painted white and gold hardware was added. The stained concrete floors were complimented with the cowhide rug. We worked with the existing taupe leather sofa. A counter-height island/dining table was added to add room for food prep or dining. We love the bold, patterned backsplash. 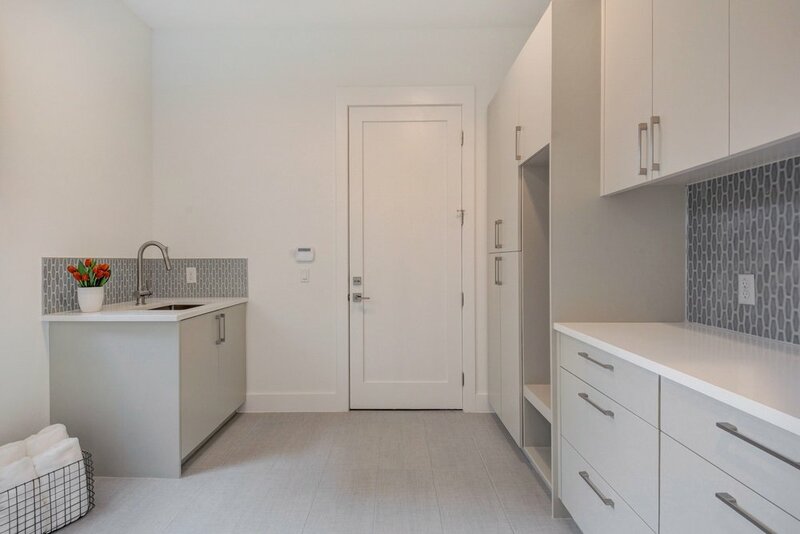 The gray, black and white compliment the gold pulls and freshly painted white cabinets. The bold pattern contrasts the brick. The master bedroom does not have a window, so it was important that we added "depth" and interest. We did this by painting the headboard wall with Sherwin Williams Deep Space. The chandelier adds luxury as does the gray bedding, mirrored console and walnut dresser with gold accents. The bathroom simply received a new light fixture, bold shower curtain, and gray paint with gold pulls for the cabinets. The investor/clients had the great idea to add a lofted guest room with wood paneled headboard wall and plenty of storage. They implemented and we added the cowhide chair and detailing. You won't want to miss this open house at 2504 Willow St, Austin TX 78702. TOMORROW - Wednesday May 25th, 2016 from 6-8. Realtors welcome. Call or text 636.577.0822 to RSVP. Or shoot me an email in the contact form. TWO HOUSES! Back house is an 850 SF, 2 bed, 2 bath with 1 car garage and roof top deck. Priced under 400k! Brand new. Front house is just under 2000 SF 3/2 with 2 living areas, loft, and 2nd story deck. We kept the 1930s bungalow and completed an incredible addition. This stunning move-up home is under 700k! Ask for Dana! Great staging by Elite Austin! Coming Soon - 2504 Willow B, Austin TX 78702 - 850 Square foot Alley House that makes the most of every inch. 2 bedrooms and 2 bathrooms, 18' ceilings, garage, and roof top deck. 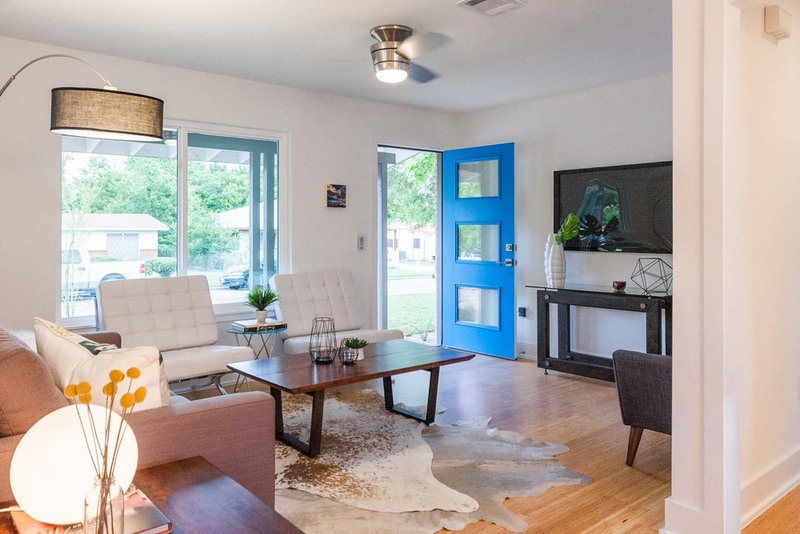 East Austin's finest small home! 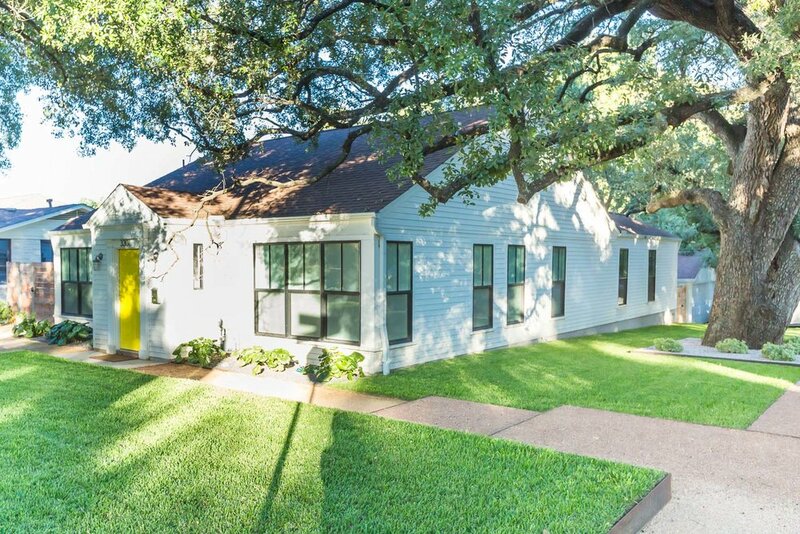 1930s East Austin Bungalow with addition! Some original wood trim. Pro images coming soon. New local hardwood Pecan floating shelves next to old 1930s brick chimney original to the bungalow! Much better pictures coming soon. But I needed to share this marble, black hex, walnut, and gold bathroom with you! This 1960's ranch was reinvented by Making Modern Home. Just completed and FOR SALE! 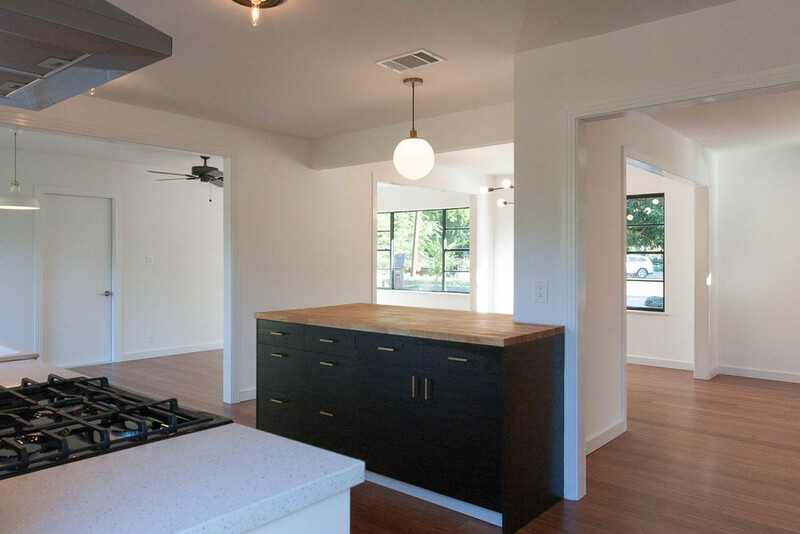 FULL Making Modern Home Renovation - Currently FOR SALE at $319,500 in amazing East Austin 78721 location. Call me at 512.777.1234. This amazing 1960s MCM ranch had great bones - such as Roman brick, horizontal lines, and a good floor plan for modifications. To get the most value Making Modern Home had to unearth it as the home had been run-down. 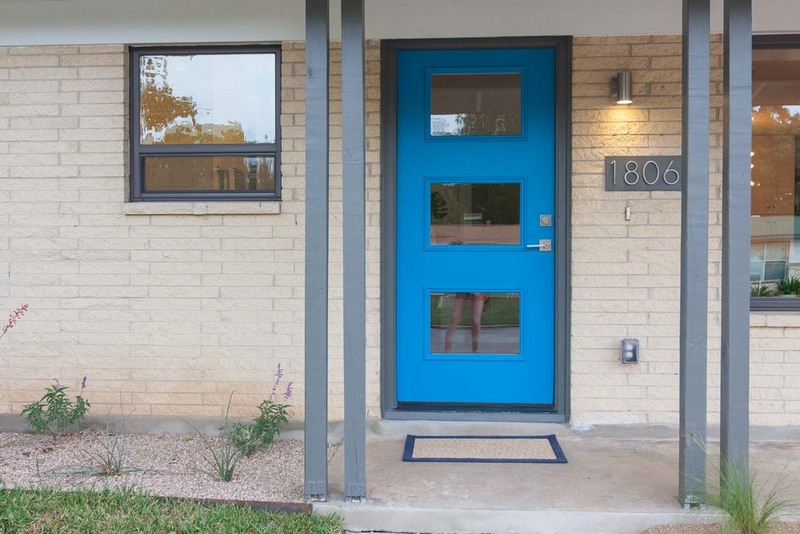 The bold blue front door compliments the mid-century modern ranch completed with the native landscape. New black bronze windows accencuate the Roman brick. 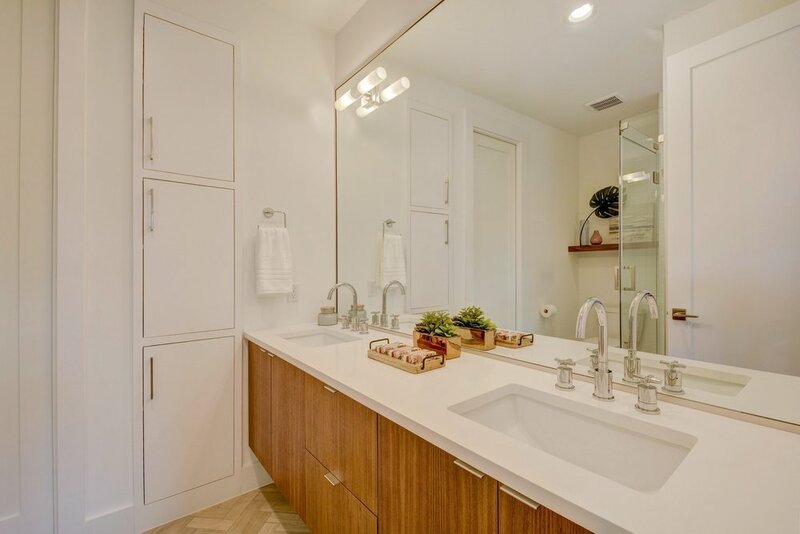 Inside walnut floating shelves and the vanity look great paired with hex tile, bamboo floors, and all white scheme. Construction by Co-Sci Construction for Hippie Hollow Homes and Fire Fighters Buy Houses. Listed by Stepstone Realty. Staging by Elite. Wow! There are so many projects wrapping up right now! Check back soon for lots of new before and after photos in May! I can't wait to share them with you. Modern East Austin Farmhouse with Turquoise Aqua Door, black windows, white siding, dormers, and native grasses. Black and gold chandelier in dining room, white shaker cabinets, black hardware, blue and yellow Spanish cementi tile in modern kitchen, champagne bronze gold Delta Trinsic faucet. Modern Living room with white oak floors, white walls, gray console, mid-century modern chair, aqua door, yellow barstools, West Elm sofa, Kilim pillow, and distressed coffee table. Master bedroom with custom modern wallpaper accent. Carrara Marble tile shower surround. Black hex tile. Gray vanity with Carrara marble top, wide spread faucet. White Oak mirror, Milan hardware. White subway tile with gray grout, slate quartzite floors, modern gray vanity with Carrara Marble vanity top. White Grimslov Ikea cabinets with modern black hardware. Floating shelves. Modern Spanish tile kitchen. Black Eames Chairs. Delta Trinsic Champagne Bronze Gold Faucet. Gray taupe tile glass backsplash. Modern Farmhouse front porch with bell school house light fixtures, white large columns, black windows, and aqua door. SEE MORE HERE in the WORK section of Making Modern Home's Website. Wow! Mid century modern Cherrywood Ranch - Just Completed and FOR SALE! I have wanted to remodel this home for over 3 years now! Finally, the dreams came to fruition. The end result is a stunning Mid Century Modern home that Making Modern Home designed, developed, and staged. It's also for sale! Give me a call at 512.777.1234 if interested, but act fast, this one will go quickly. 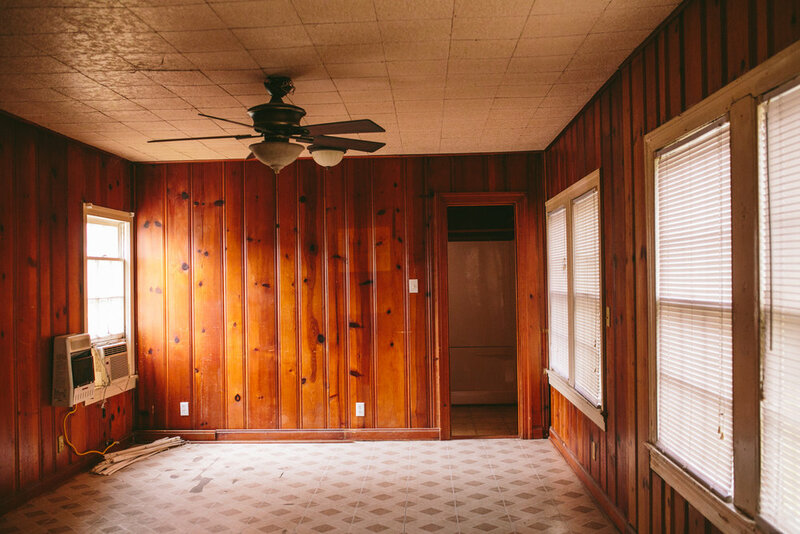 SEE MORE IMAGES HERE Located in the heart of the Cherrywood, this 1950's home had great bones, but they were hidden under decades of neglect. After a thoughtful and full remodel, this modern ranch has come alive! 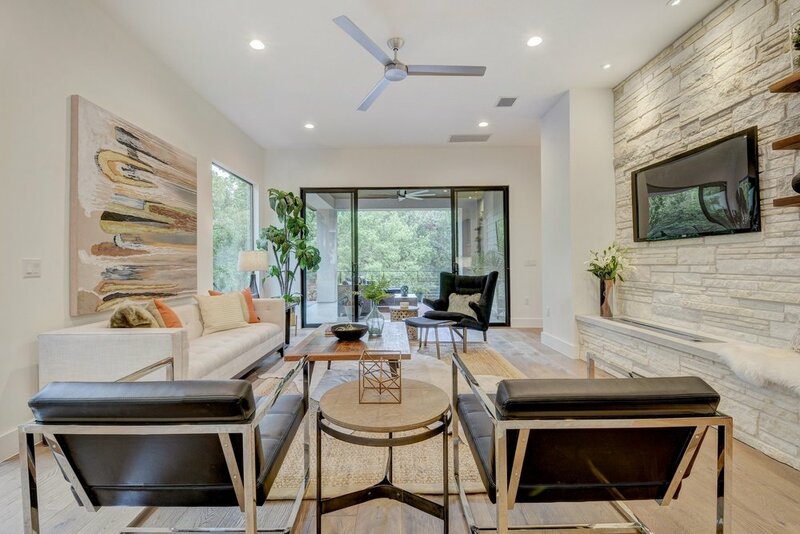 Now, this home epitomizes the Austin indoor-outdoor lifestyle. The refinished white oak floors (and new floors in the kitchen to match) serve as a foundation for the other finishes in the home. The kitchen has Ikea Applaud cabinets (that look remarkably high end due to quality installation and planning) and shittake color Caeserstone countertops with a carerra marble backsplash, Completing the kitchen is the champagne bronze faucet and Bertazzoni range. 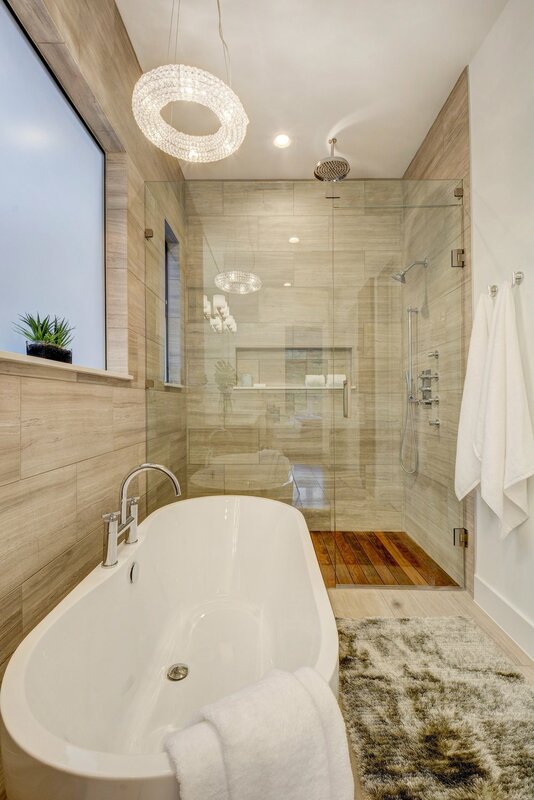 The bathroom has brass fixtures, black hex tile floor, and carerra marble walls for a classic look that's still modern The original interior doors were restored to bring much needed character to the home. We hope that our renovation and staging celebrates everything this home and neighborhood has to offer! CHECK BACK SOON FOR BEFORE PICTURES. Call me to arrange a viewing if you are interested in buying this home or one with potential to be like this one! 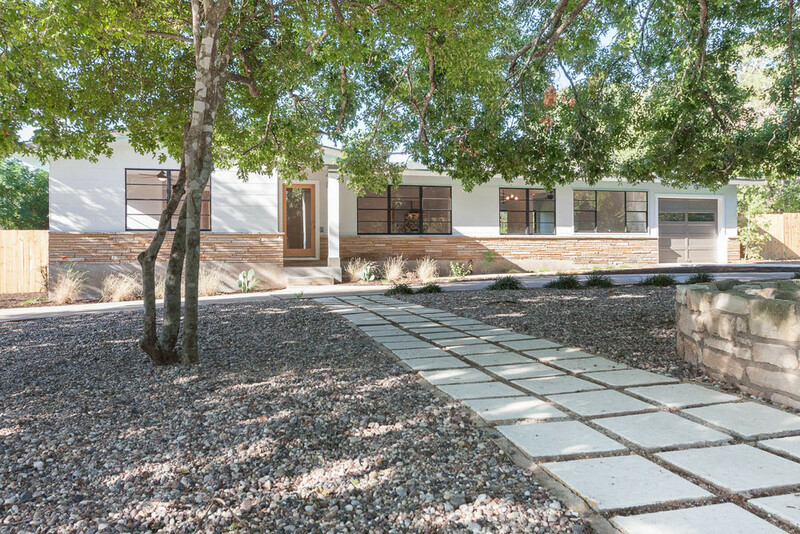 Making Modern Home is thrilled to just finish this stunning Mid Century Modern Ranch on one acre in South Austin. 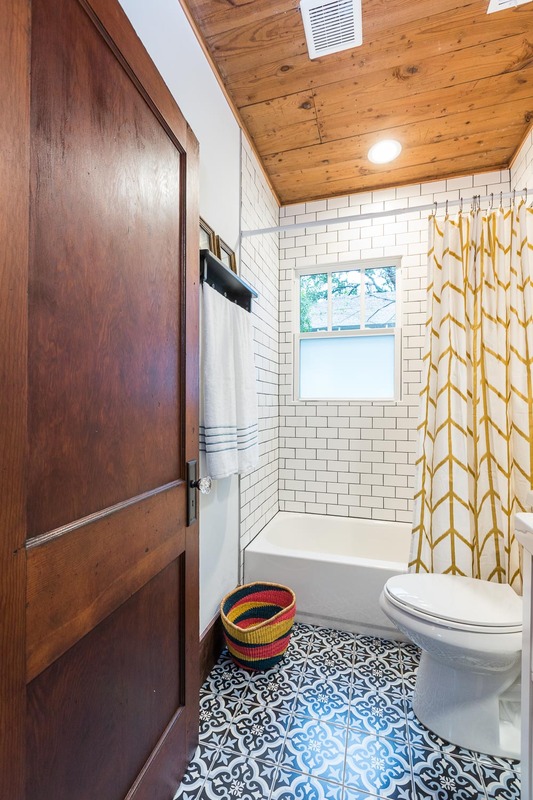 Despite the fact that this home was an investment property (flip) I made some bold design choices including the use of "cementi" tile for both bathroom floors, a graphic tile backsplash, and all brass or black hardware. The end result is stunning! See below for more detail on how to find brass drawer pulls for under $4! Here is one of my recent projects. It really came down to the details. By selecting era appropriate hardware paint colors, white hex tile flooring with black floret detail in the bathroom, and by taking out all the door hardware, stripping it, polishing it, fixing it, and re-installing it (big thanks to my carpenter who made this his labor of love) this Hyde Park Bungalow became charming, neighborhood appropriate and appealing to buyers. Check out the sweet bungalow front porch complete with a flag and fern. More pictures at the WORK section of this website. Austin Bungalow Hyde Park front porch with flag and fern and 5 color paint scheme. The permitting and inspection process is daunting, time consuming, and expensive, but it is manageable. Let me help you through it! JUST COMPLETED! The design vision for this run down house in a quiet, traditional neighborhood was to create Modern Hacienda with a MINUSCULE Budget. We achieved this by painting the reused cabinets a fresh green, pairing it with oak butcher block, using great looking warm laminate floors (seriously, they look amazing! ), readily available lighting, and fresh trim. The floorplan was unaltered. We used a real carrera marble shower surround and honed green slate flooring. It just went on the market, but it's probably already pending because this modern hacienda is capturing so much buyer attention. Photos by others. Listed by Castle Hill Investments. Contact me to view. 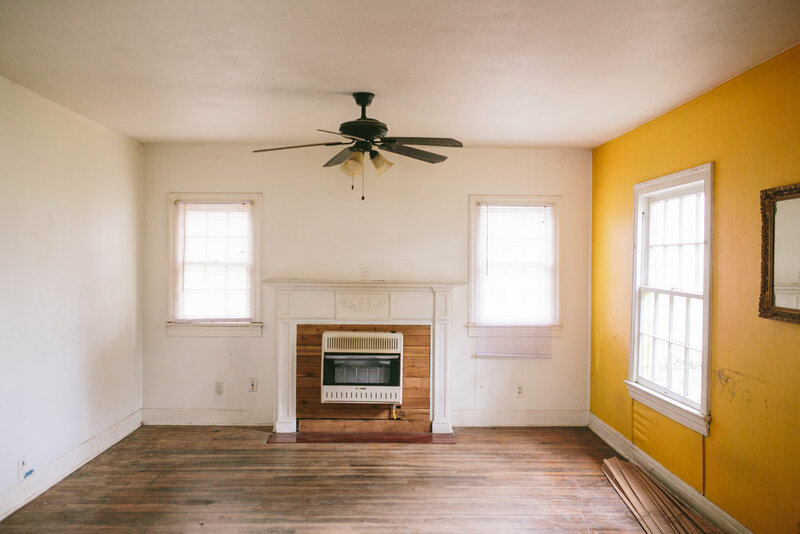 Do you want your house to look similar and have this much buyer appeal? Contact me! Fresh Green Cabinets, Oak Butcher Block, White subway with gray grout. 307 Thistlewood 78745 - Just Completed and For Sale! Perfectly Vintage Modern. We just finished the amazing transformation, and I am the listing agent (Lee Real Estate Services Inc, BROKER). This house is filled with light, charm, and features. Not your average flip. 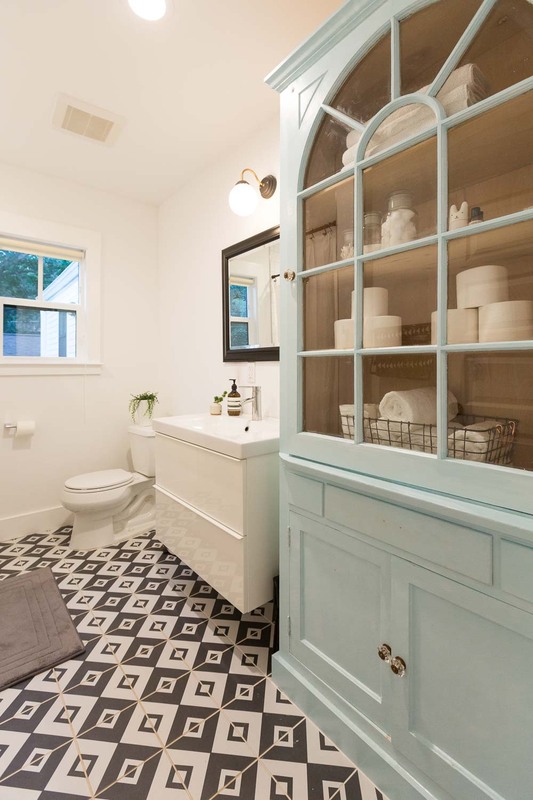 Check out the salvaged bead board details, cherry butcherblock countertops, Ikea cabinets, GE Artistry appliances, Ikea farmhouse sink, aqua blue penny tile, and carerra marble shower surround. This home is perfect for the new buyer! Call 512.777.1234 today with questions or to see the property! See more at the WORK section of my website! Here's that 3/2 "grandma's house" from my first blog post all finished up and ready for its Mid Century Modern spotlight! 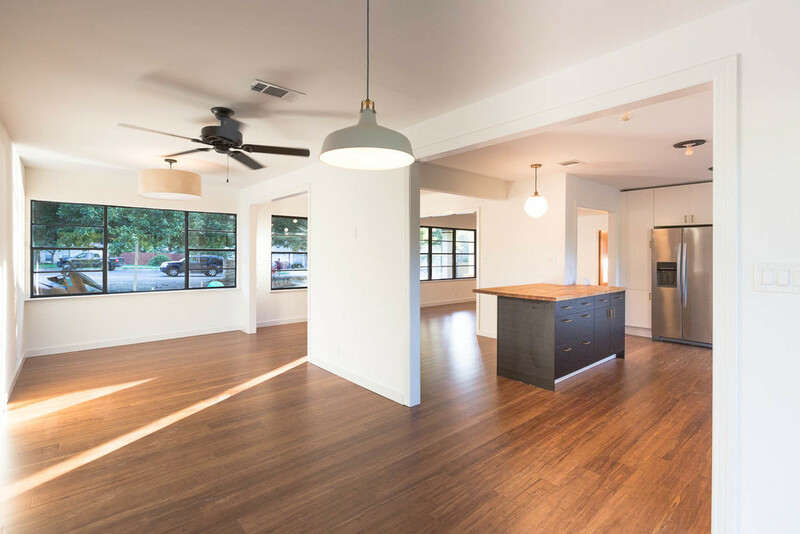 We just finished this stunning remodel and made it feel like a bonafide MCM ranch. 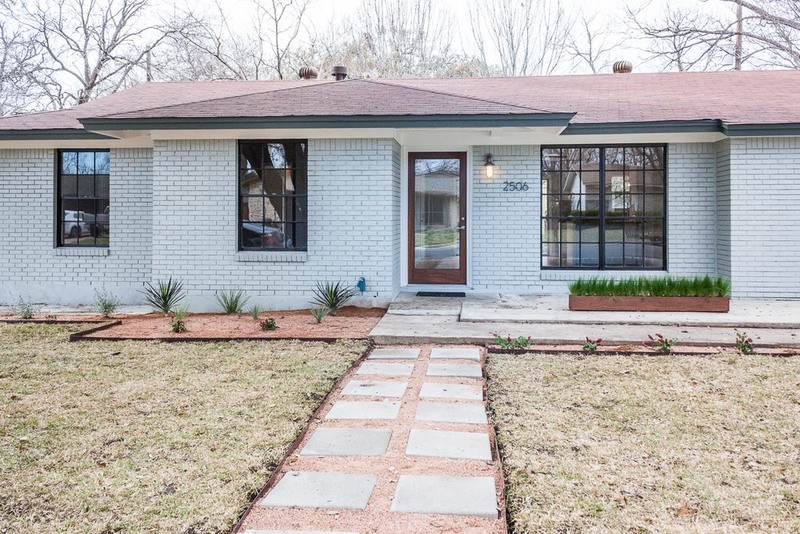 By painting the aluminum windows black and the brick a warm gray we achieved the striking Austin Classic Modern exterior. Hurry, offers are pouring in! Listed by Castle Hill Investments For more details, see Work section of my website. Looking to Remodel on the EAST SIDE on in Hyde Park? We would love to get our hands on some East Side and Hyde Park remodels! Let me know if you want a professional designer/contractor to remodel your home fully on Austin's East Side. Dana@makingmodernhome.com. 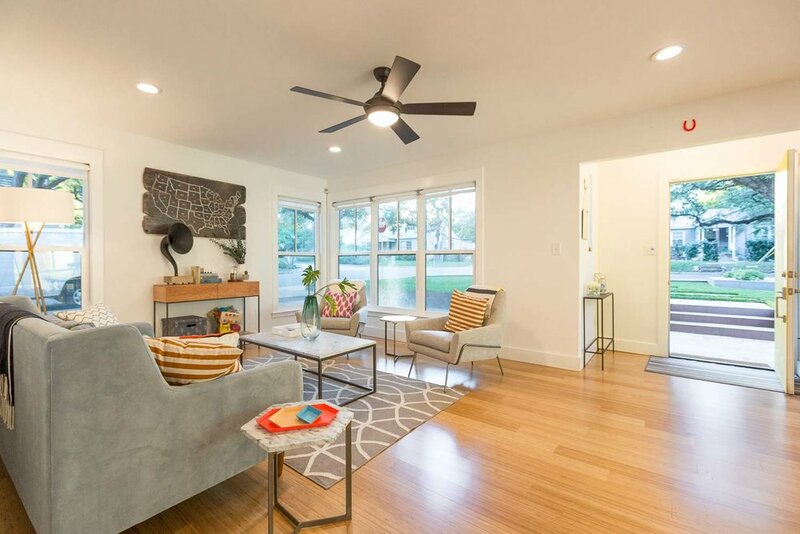 We specialize in working with investors, so if you are looking to flip and have found the right property, rely on Making Modern Home's expertise to add value and get you top dollar! We can list your property as Realtors too if needed or represent you during the purchase. Looking for Pocket Listings in 78704 and 78745? Making Modern Home and Redemption Home Solutions are collaborating on several projects right now and this is just one of many that we can't wait to share with you. 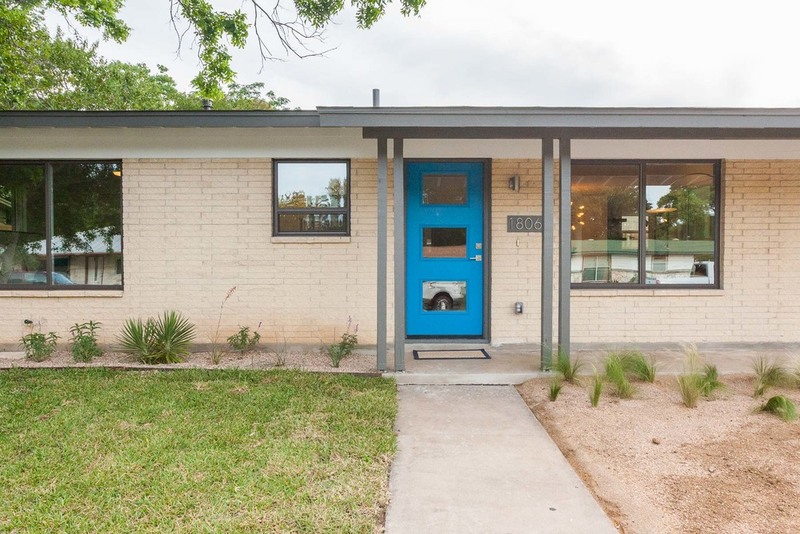 It's Mid-Century Modern, super close to the Broken Spoke, Barton Hills, Zilker, and South Lamar! Listed by Castle Hill Investments. http://www.realtor.com/realestateandhomes-detail/2304-Westrock-Dr_Austin_TX_78704_M80397-96106 Check out the main gallery at www.makingmodernhome.com for more images. Ideas, Inspirations, Plans, and What we learn along the way. This blog chronicles the exciting design, build, real estate world. Don't be alarmed by what you see here. 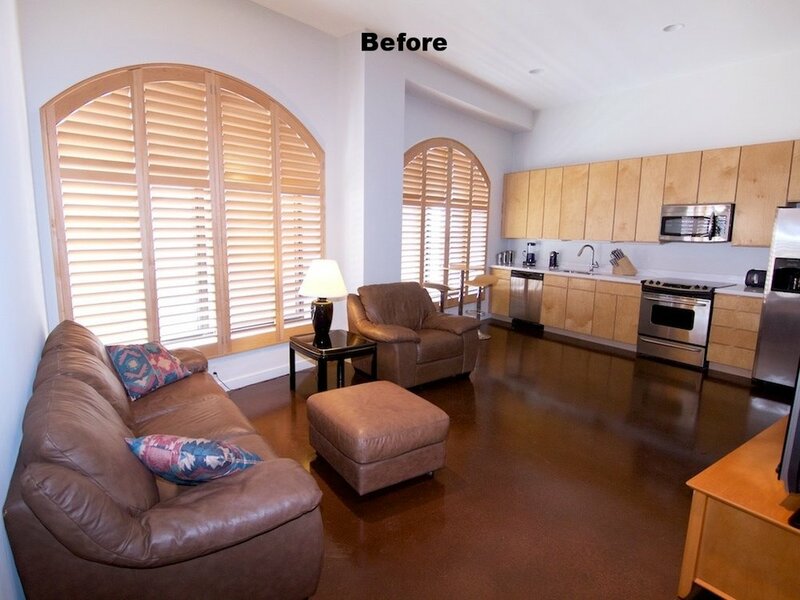 Visit our WORK to see how we get from the BEFORE to the AFTER. 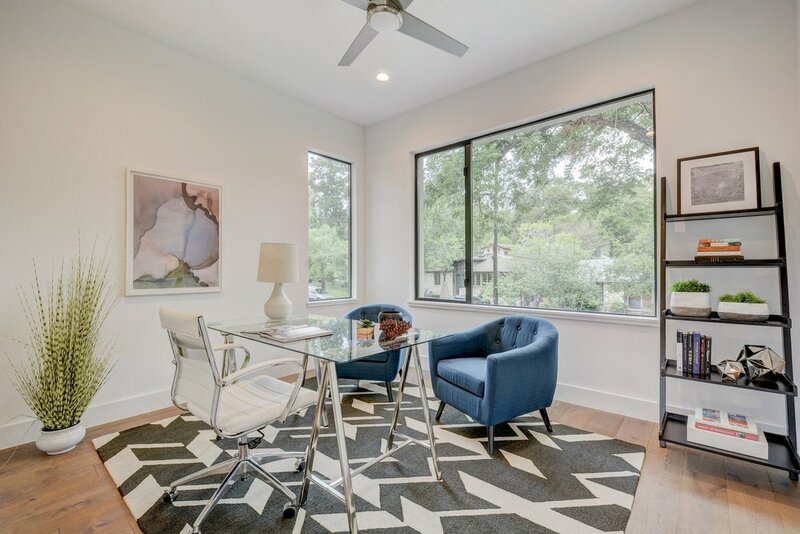 Join me #today at this #modern #eastaustin #openhouse #forsale #makingmodernhome #designed it and @eliteaustin did the incredible #staging perfect for #modernlife Loving the #blackwindows #walnut #floatingshelves in the #kitchen and #concrete #floors Do you like the peek at the #scallop #tiles ? 1-4 today - Sunday. Contact me for the address!